Ireland has followed a number of other EU countries in recognising Juan Guaido as interim President of Venezuela. Minister for Foreign Affairs Simon Coveney said he supports Mr Guaido, the leader of the legislature, "in order for him to call for free, fair and democratic presidential elections". It follows statements from Spain, Germany, France and Britain, who publicly supported Mr Guaido over President Nicolas Maduro after an EU ultimatum calling for fresh elections passed on Sunday without any action. 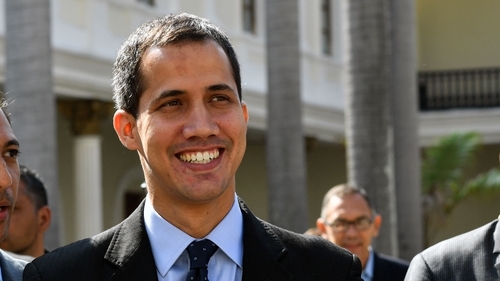 Mr Guaido proclaimed himself acting president last month, leading to claims of a coup by Mr Maduro, who has been in power since the death of Hugo Chavez in 2013. Mr Maduro won snap elections in May that were boycotted by the opposition and dismissed as a fraud by the European Union and the US. Today’s statement from Mr Coveney marks a shift from the position on Monday. When asked whether Ireland would follow other EU countries in recognising Mr Guaido, the Tánaiste then responded: "No, our position has been clear. We want to see free and fair elections for the people to make a democratic decision in Venezuela." However, in a statement today, Mr Coveney said: "I have repeatedly called for the urgent holding of free and fair Presidential elections in Venezuela in accordance with democratic standards and the Venezuelan constitutional order. "In line with the common EU position and statement by HRVP [Federica] Mogherini on 26 January 2019, I supported further EU actions, including on the issue of recognition of the country's leadership if fresh elections were not announced. "In the absence of such an announcement, I join other EU Member States in acknowledging and supporting Mr Juan Guaido, President of the democratically elected National Assembly, as President interim of Venezuela, in order for him to call for free, fair and democratic presidential elections. "I am keenly aware of the right of the Venezuelan people to freely choose their future, and am committed to finding democratic solutions that can bring political stability and address the pressing needs of the people. " He said he would speak to Mr Guaido in person to communicate the Irish position. The decision has been criticised by Sinn Féin, who accused Fine Gael of supporting an "undemocratic coup" in Venezuela, which it said is a "worrying development in Irish foreign policy". Senator Pádraig Mac Lochlainn said only the Venezuelan people can decide their President. "A presidential election took place in May 2018 and Juan Guaido got 0% of the votes," he said. "Nicolás Maduro was re-elected as President by the Venezuelan people in the May 2018 presidential election. Whether you agree or not with his policies, he is the legitimate President of Venezuela. "The Tánaiste's statement today, just before he arrives in Washington DC for meetings with the Trump administration, and on foot of pressure from NATO's European members, is a worrying development in Irish foreign policy and adds to instability in Venezuela. "Considering the prospect of outside military interference and a civil war in Venezuela, the Tánaiste's statement is a disgrace and reckless in the extreme." Mr Maduro has repeatedly accused the US of fomenting a coup. The US, which has not ruled out a military intervention in crisis-wracked Venezuela, was the first to recognize Mr Guaido as acting president, followed by a dozen Latin American countries. In his State of the Union address last night, US President Donald Trump reaffirmed US support for Mr Guaido, saying "we stand with the Venezuelan people in their noble quest for freedom".